The gentleman at the front desk was rude and had the same attitude when he came to our room. The event I was attending was in Uxbridge so the location was perfect. Room was surprisingly spacious. Bed was very comfortable (not super soft like many other hotels and not hard either - Goldilocks would be proud). Easy to control temperature. Bathroom was roomy. I liked nothing of this place. It is severely outdated. The staff is nice enough. Check in was a problem in that the key didn't work to get into the room. The manager came, agreed and gave us another room. The motel is located near a place we wanted to be. The location for what we had to do, the price was good. The owners are trying to improve the overall condition of inn, if they continue the inn will be as good as a motel 6 someday. Large clean comfortable room, equipped with everything I needed, Fridge. Microwave, iron&board, shower has great pressure, AC, next door to a pub with good food. Very quiet room. Pleasant experience. The gentleman was nice, but confused about the room and the key/lock on the room. This was an emergency situation, as we lost power at our home. Very friendly the staff and the rooms were clean..would come back again. And recommend to other people. 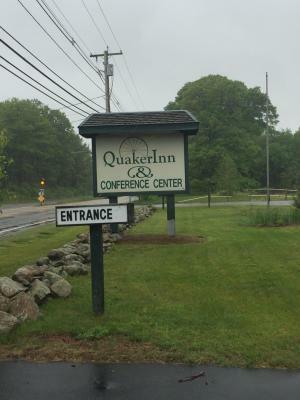 Quaker Inn & Conference Center is offering accommodations in Uxbridge. Both private parking and free WiFi are available on site. At the motel, rooms contain a closet and a flat-screen TV. Each room includes a private bathroom. Providence is 20 miles from Quaker Inn & Conference Center, while Worcester is 19 miles away. The nearest airport is Worcester Regional Airport, 24 miles from the property. This property also has one of the top-rated locations in Uxbridge! Guests are happier about it compared to other properties in the area. This property is also rated for the best value in Uxbridge! Guests are getting more for their money when compared to other properties in this city. When would you like to stay at Quaker Inn & Conference Center? House Rules Quaker Inn & Conference Center takes special requests – add in the next step! Quaker Inn &amp; Conference Center accepts these cards and reserves the right to temporarily hold an amount prior to arrival. Quaker Inn & Conference Center accepts these cards and reserves the right to temporarily hold an amount prior to arrival. The service and the beds.Better service would have been nice. The exterior doors to the interior rooms were not locked (note: this hotel has rooms with exterior doors AND a hallway with interior rooms). I'm unsure if this is related, but at about 0630 each morning someone would practically stomp down the hallway, talking loudly (cell phone?) and use the Emergency Door. It would slam shut. They would return shortly thereafter by the same door. Slam. After a little bit of this it would stop for the day. Maybe someone going to work? My suggestion to the property: lock the emergency door and have the other entrances require a key swipe. The floor under the counter had a large spill from the previous guests that was never mopped, empty drink containers under the bed and the handle in the shower fell off. Disappointing and not very clean. No access to ice. No vending machines for drinks or snacks. Its out dated, dirty, overpriced, and seedy. When you have to worry about sketchy drug use and deals, you know you're in the wrong place. Sheets on beds were dirty, one had pubic hairs and the other bed had stains all over and had not been changed since previous tenant. Fridge had no shelves, freezer was totally covered in ice and could not be used. No smoking room but people sitting outside my room smoking, really strong smell in room from this. This is a hotel where homeless and welfare people live. No water pressure for showers. Not much other than convenience to relatives. Returned to room after 10 pm after a nite out. dead bolt didn't work and the door couldn't be locked. locking system in door has been very poorly repaired before. Propped a chair against door for safety. left early next morning , office closed , did not talk to anyone. This is an older motel that has been kept up but it shows its age. This place was more for locals. When we parked there was a woman standing in front of her room swaying and staring at the ground. You could tell she was on drugs. Heroine I believe. It is definitely a drug infested area. There was no ice machine on the grounds at all. But the location was good for what we were in town for. There were no pictures for the hotel online. Had there been pictures, I would not have stayed there. The room was ok and spacious, since were in the newer wing. Bathrooms were big and had lots of lighting. The back parking lot does not have adequate lighting. It is not a safe building because anyone can walk into the back area on building C. Please make efforts to change that. The parking lot is dangerous.